Copper Chef Wonder Cooker Reviews - Is it a Scam or Legit? Copper Chef Claims that their pan can replace $1,300 worth of pans and cooking appliances. Could this be the ultimate pan to replace all pots in the kitchen, and can it work on the grill? Endorsed by Eric Thesis, the Copper Chef Wonder Cooker uses a 5-layer construction with thick cast Cerami-Tech Non-Stick Coating. Free from PTFE and PFOA, this pot is also safe and family friendly. There are five main configurations to the pan, composed of a shallow roaster, grill pan, double cooker, roaster, and Dutch oven. The top of the pot doubles up as a lid or as a shallow non-stick pan that you can use together or separately to grill a steak, to braise ribs, or bake fresh homemade bread. The company says that you don’t need to use any additional butter or oil when cooking, and they recommend that you only use utensils made out of wood, plastic, silicone, or bamboo. As far as cleaning is concerned, Copper Chef recommends you wash it by hand with a mild soap using a soft, non-metallic scrubber or sponge. If you’re not into washing dishes by hand, fear not, they say that you can also put it in the dishwasher! Available to buy directly from the company’s website, you also have the choice of two different sizes, 9.5 qt. and 12.5 qt. Payments can be made for a single fee of between $74.97 - $ 104.97, or in three payments of $24.99 - $34.99. When you purchase a single Wonder Cooker, you’ll also get a recipe book and a $100 grocery coupon. In addition to that, you’ll receive a free four-piece accessory package valued at $100, for a separate P&H fee of $19.99. Another option that might grab your attention is the choice of an upgrade. For a single payment of $134.97, or three payments of $44.99, you’ll receive a 12.5 qt. pot, along with the recipe book, $100 grocery coupon, and three-piece accessory package (plus P&H fee). Each order comes with free shipping (excluding processing and handling), a 60-day money back guarantee, and a limited warranty. The manufacturer ensures that your non-stick coating is free from defects in the materials and workmanship. It is also warranted not to peel, chip, or blister with regular home use. However, if warranty service is necessary after the expiration of your 60-money back guarantee, you can send the pan back, postage paid, with a description of the problem, date of receipt, proof of purchase, along with a money order for $14.99 per pan. Does the Wonder Cooker Work on The Grill? An exciting feature of the Wonder Cooker is that the manufacturer advertises you can use it on the BBQ. Could this be true? Now, we didn’t find much information on the website about it, so we called customer care to confirm. The answer they gave us was “yes, it’s safe to use on the grill.” They reassured us that the cooker, both pot, and lid, can take temperatures of up to 850 degrees, but were most likely will never have to use it that hot. We haven’t tried it out on the grill ourselves, so we can’t confirm that this claim does what it says. Although this is a handy feature to have in a multifunctional pot, there doesn’t seem to be anything particularly unique to it as there is a handful of other non-stick pans that are also advertised as safe to put on an outdoor grill. In fact, we reviewed a similar product called Gotham Steel Double Grill that costs about $25. It’s also free from PTFE/PFOA, is dishwasher safe, and can be used on indoor and outdoor grills. Do Other Pans Offer as Much Functionality as the Wonder Cooker? One of the main claims made about this cooker is how it will replace over $1,300 worth of cookware in your kitchen. Going over all the functions the company suggests you can do with just one pot, and calculating the possible savings from additional cookware, it could add up to that much. Although we didn’t test it firsthand, we’re slightly skeptical about a few aspects of this claim. There’s no denying that this pot is capable of cooking a large variety of recipes, from baking, roasting, and frying, but unless you’re making a one-pot meal, it doesn’t provide more than two cooking surfaces. Using both the lid does give you more flexibility, but we’re still not convinced that this one pot alone could effectively replace all other cookware in your kitchen, especially if you need more than a couple of simultaneous cooking surfaces. Aside from the five configurations of what you can use the cooker for, a potential plus to investing your money into this 14-function pot, is the grill factor, and the use of both the lid and pan is sort of like a two-in-one. Perhaps one of the unique aspects of the Wonder Cooker could be the addition of the induction plate on both the pot and the lid. Bottom Line – Should You Buy the Copper Chef Wonder Cooker? Speaking of coatings, we’ve learned that consumers often report better initial results with ceramic options, although the sol-gel it’s constructed from tends to degrade faster than PTFE coatings, which could greatly impact length of use and overall value. For more about what to look for in a non-stick pot, we’ve put together a comprehensive guide in a previous article on how to buy the best non-stick cookware. Getting back to the Wonder Cooker to help you decide if it’s worth the investment, we wanted to leave you with a few keynotes we collected from a review we did on another pan from Copper Chef product line. Since it seems that these two pans use the same Cerami-Tech coating, we thought it would be beneficial for you to know what people were saying after they used the original Copper Chef pan, as well as a follow-up review we did after testing it out ourselves. Out of 483 reviews we collected on HighYa, the Copper Chef received a 2.3 rating with customers telling us that they were very disappointed with their purchase. Complaints were made that the pans were poor quality and scratched easily, especially considering their price. From our follow up review, we were pleased to see that it could comfortably handle the dishwasher without any noticeable scratches. However, one thing we did notice is that it did not live up to its non-stick claim. After only using it for a few weeks we tested it again by cooking an omelette on it. We found that it stuck to the pan considerably, leading us to believe that it would definitely need oil for further use. The bottom line is that we’re only here to present the information and leave the final decision up to you. But based on what we’ve learned and reviewed on similar products from the Copper Chef line, along with a handful of competitors that we’ve written about, such as Red Copper Square Pan, and Gotham Steel Square Pan, as consumers ourselves, we don’t think there is anything particularly unique to the Wonder Cooker. However, if you find it practical to have a multifunctional one pot that potentially offers two cooking surfaces while you cook, then you can always try it out and receive your money back guaranteed. Just remember that you’ll lose any of your initial S&H or other charges, plus whatever you’ll have to pay to ship it back to the manufacturer. These pans are the best pans ever. They are deep and not heavy at all. I make a party mix all the time and my chili pots were too tall to really stir everything up. I used the casserole pan, so much easier. Made the pot roast with the brussels sprouts in another pan and it was awesome. I already told my husband I wanted another set for Christmas next year. 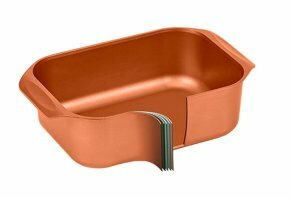 Write a Review for Copper Chef Wonder Cooker!